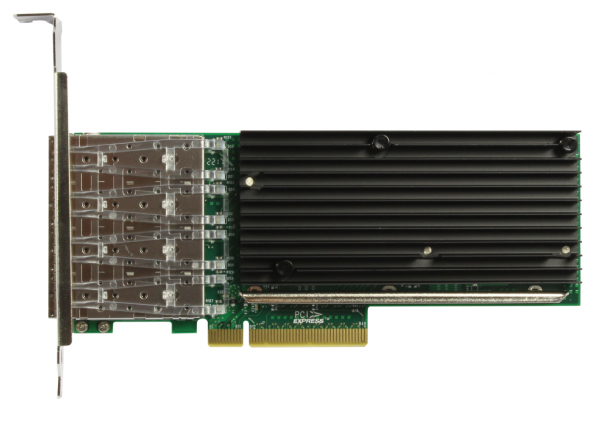 Produktinformationen "ALLNET ALL0141-4SFP+-10G / PCIe 10GB Quad SFP+ Fiber Card Server"
ALL0141-4SFP+-10G is ALLNET a new generation of high- performance server adapter, based on the Intel XL710-BM1 controller. The Server Adapter addresses the demanding needs of the next-generation agile data center by providing unmatched features for both server and network virtualization, flexibility for LAN and SAN networks and proven, reliable performance. Reduces power consumption during periods of low data activity. Energy is used to maintain the physical layer transmitters in a “ready state” to transmit data on the wire. During periods of low data traffic, EEE sends a low-power- idle signal to put the transmitters into a “low power state” saving power and cost. When data needs to be sent, EEE sends a normal idle signal to wake up the transmit system before data is due to be sent so there is no degradation of performance. Network virtualization is the next big trend in creating an agile data center. The ALL0141-4SFP+-10Gadapter is ready to help you take that next step. With Intel Virtualization Technologyperformance for overlay networks. With these offloads it is possible to distribute network traffic across CPU cores. At the same time XL710 offloads LSO, GSO, and check-sum from the host software reducing CPU overhead. Flow Director is an advanced traffic steering capability built into the XL710 controller. It consists of a large number of flow affinity filters that direct receive packets by their flows to queues for classification, load balancing, and matching between flows and CPU cores. It eliminates context switching required within the CPU. As a result, Flow Director significantly increasing the number of transactions per second and reduces latency for cloud applications like Memcached. ALL0141-4SFP+-10Galso incorporate the manageability required by IT personnel for remote control and alerting. Communication to the Board Management Controller (BMC) is available either through an on-board SMBus port or the DMTF-defined NC-SI, providing a variety of management protocols, including IPMI, BMC Pass-thru, OS2BMC, and MCTP/SMBus and MCTP/PCIe. Weiterführende Links zu "ALLNET ALL0141-4SFP+-10G / PCIe 10GB Quad SFP+ Fiber Card Server"